We all know the stereotypes of full time van life or so called “van lifers”. Hippies that don’t shower and practice yoga daily, youngsters in their parents old station wagon resisting a real career, middle aged married couples with dream catchers who want to revamp their marriage. And, of course, old men who love windmills. Although I’m sure there are plenty of beautiful vandwellers that fit these molds, I’ve yet to meet them in my 2 years on the road. 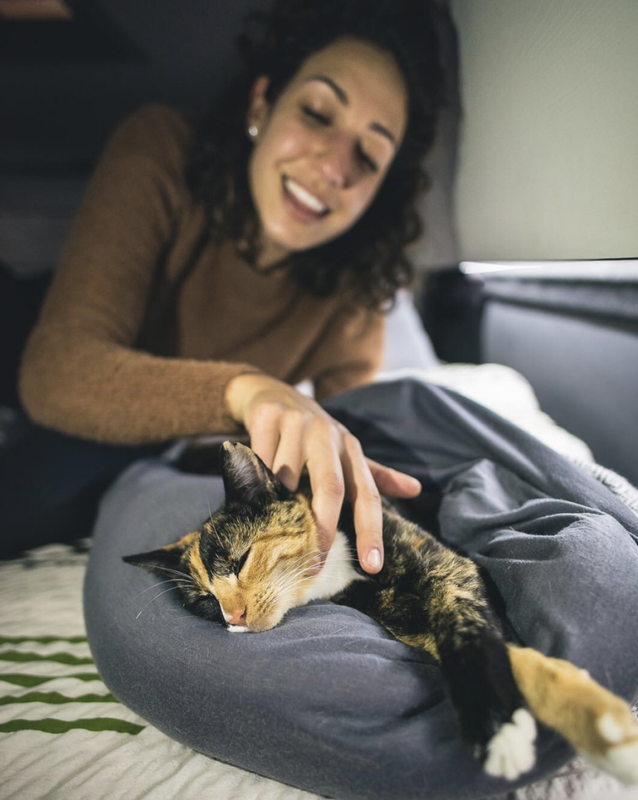 This post has been guest written by our good friend Margaret from @curlyhaircamping on Instagram! 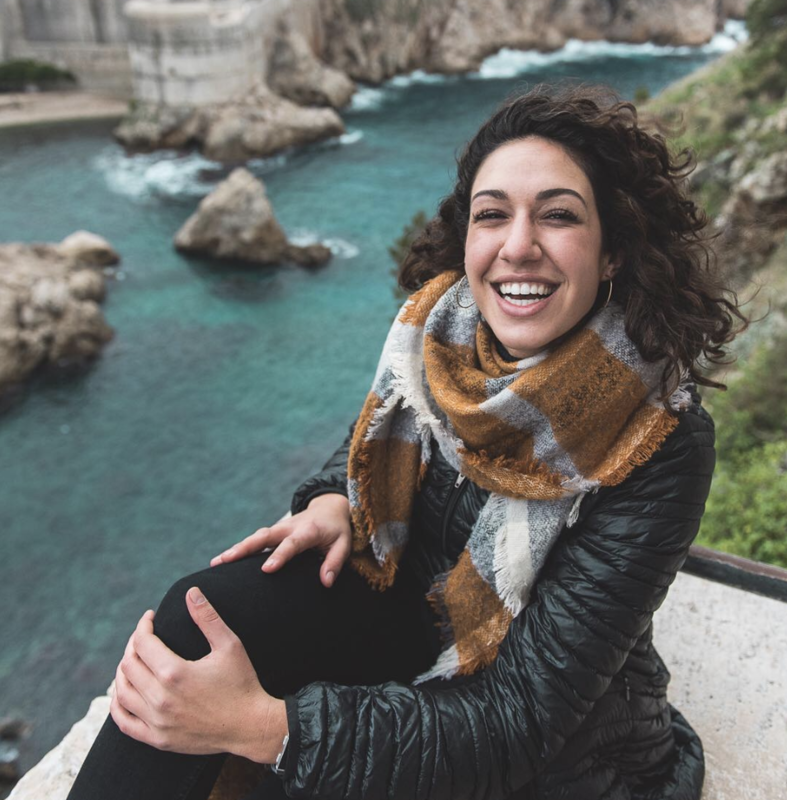 Join our Van Lifers and Weekend Warriors community group to meet new travellers and learn more about this awesome community. 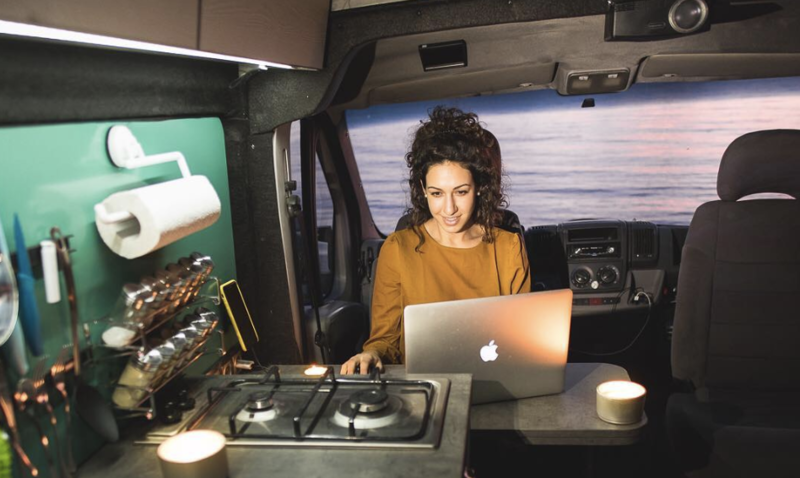 Why Living The Full Time Van Life Is No Sacrifice… At All! People are surprised when they learn my partner, Ladislav, and I live in a car. Maybe because we don’t look like the stereotypes I listed above. We both went to university, we dress well, carry iPhones and Nikon cameras, and spend some of our time in places ridden with five star hotels and top rated restaurants. We’ve made sacrifices, but they aren’t the ones many would expect. 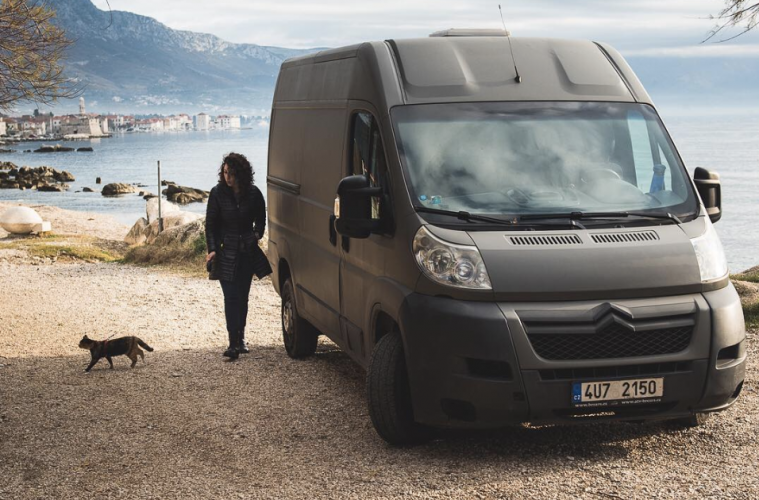 Below are seven things we have never sacrificed for a mobile lifestyle in a Citroen Camper Van Jumper L2. One large assumption about van living is you’ll be forced to digest gas station sandwiches and not see a real vegetable for 3 months. We might not be foodies, but we know how to cook. 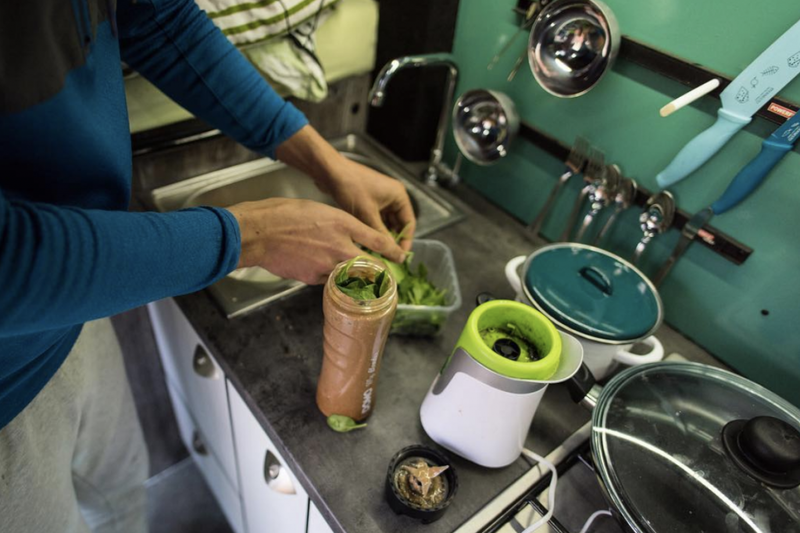 In our van we have a blender, panini maker, fridge, stove, sink, chopping boards, rice cooker, kettle and plenty of spices. We are equipped with all the plates, bowls, and cutlery you’d find in any apartment. 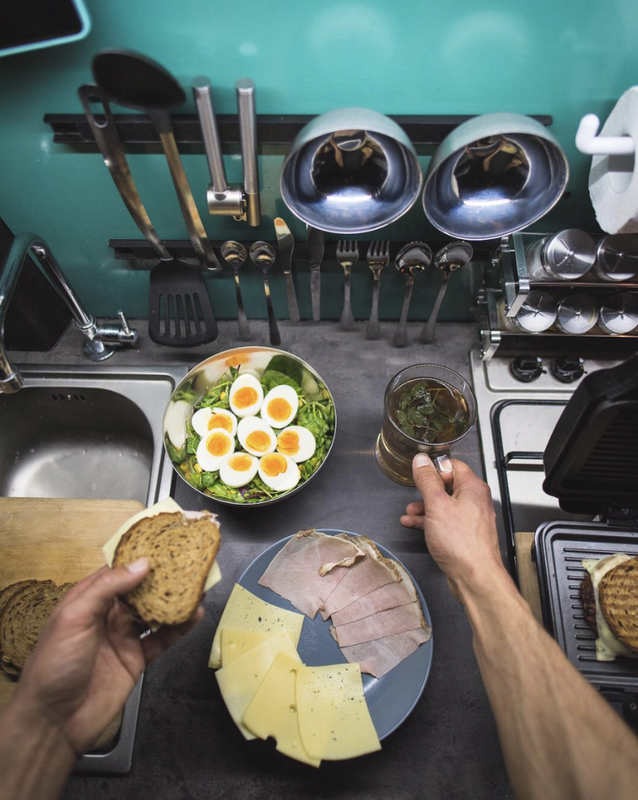 Ladislav has morning smoothies with omelettes and buttered bread. I opt for a large coffee with a biscuit and jam. For lunches we make starter soups and toasted sandwiches, while dinners consist of beef stews with rice, or maybe a cheesy tomato pasta. Basic van life recipes, but we like to spice it up a little. Cooking ourselves not only favours our wallets, but also gives us the ability to pull over at any road junction, parking lot or neighbourhood to eat whatever we’re in the mood for. This kitchen isn’t large either, everything we need takes up less than a meter of space. Every traveler has a different definition of clean. Does it mean to shower daily? We do. Does it mean never wearing the same shirt as yesterday? Or does it mean brushing your teeth twice a day and washing your face? I can only speak for us as a couple, and I know us to be clean. We wash our clothes weekly, whether at a laundromat or by hand, but yeah, we sometimes wear the same shirt twice. We utilize our sink for the hygiene basics and have a camper shower out the back door, complete with a privacy curtain. I’d also add that my feet smell regardless of where I live. Adult toys are probably our biggest weakness. We both have our own phones, laptops, a GoPro, and a drone… plus, Ladislav has an entire photography setup. 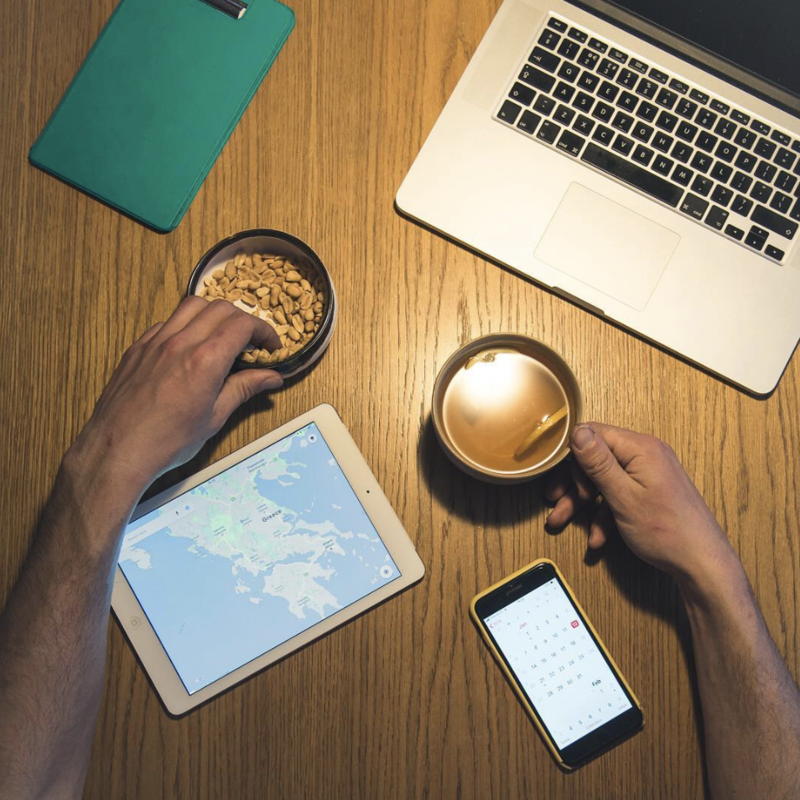 We rely on our gadgets for GPS, sightseeing suggestions, safe camping locations, and instagram. 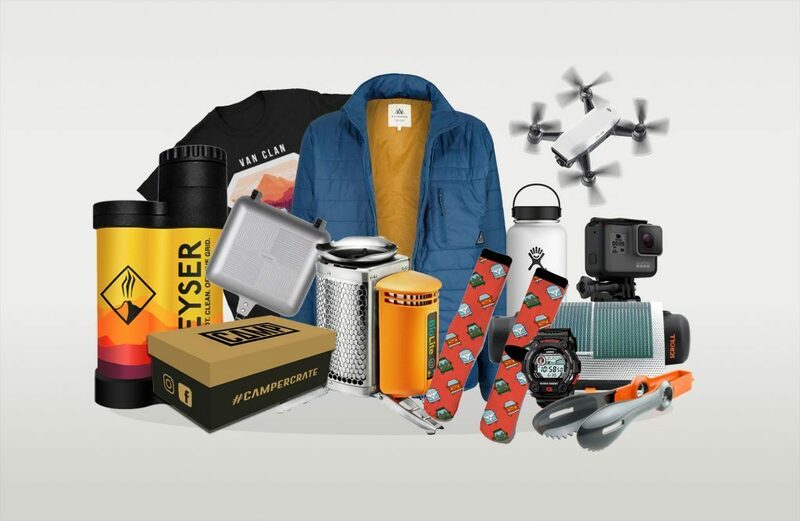 Typical millennials, I suppose, we need our van life essentials! With this tech come all the respective cables, headphones, cases for the headphones, charger heads, the extra charger head, and multi-socket blocks. Plus that one cord we are scared to throw away because it could be for something important. We also travel with two large electric bikes, both dependent on a specific charger. We installed a full screen projector, too. It’s mostly for movie nights, but the reason behind its original purpose was simple: Game of Thrones Season 8. Usually, the main gadget concern has hovered around charging and how to do it efficiently, but Van Clan showed us the way forward: inverters. We’ve recently installed solar, but our van is also equipped with multiple USB outlets and 3 European sockets run on a separate multi-battery setup inside. It can either be charged via our panels, from regular electrical outlets, or as we drive. It’s been fun to find public electricity sources, such as the Tesla Charging stations throughout Europe. Our heater and fridge are also routed to those same batteries. 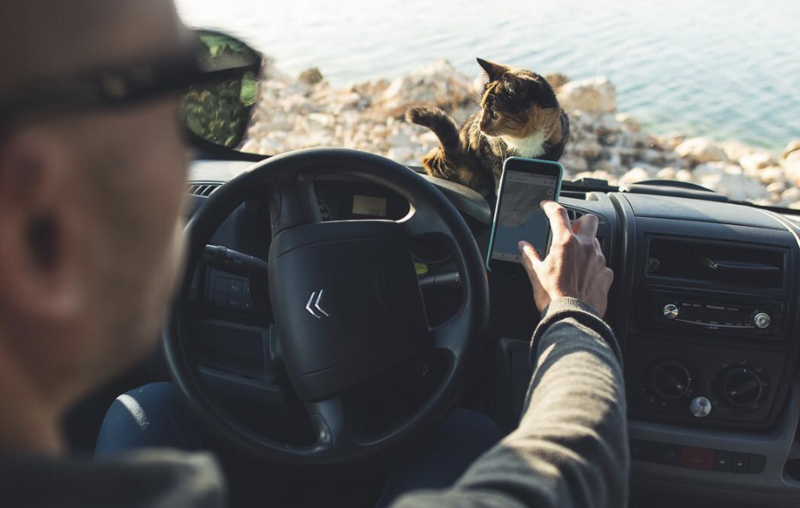 Living in a car doesn’t mean becoming technologically obsolete, it just means finding creative ways to charge your favourite toys. Keeping in close contact with the people we care most about is one of our top priorities. Not calling home or checking in regularly can feel a bit isolating during your time on the road. We’ve flown across the world to attend weddings and holiday parties, but you can only do that so many times a year. Between those trips we’ve found a balance: “WhatsApp” messaging. We send photos of our van to our families from just about everywhere, be it Africa or Europe. We have group messages, video chats, etc., but the main reason we turn to WhatsApp is for their voice recording system. I’m notorious for long voice notes. I believe my longest is close to an hour, but that was after a couple glasses of wine. 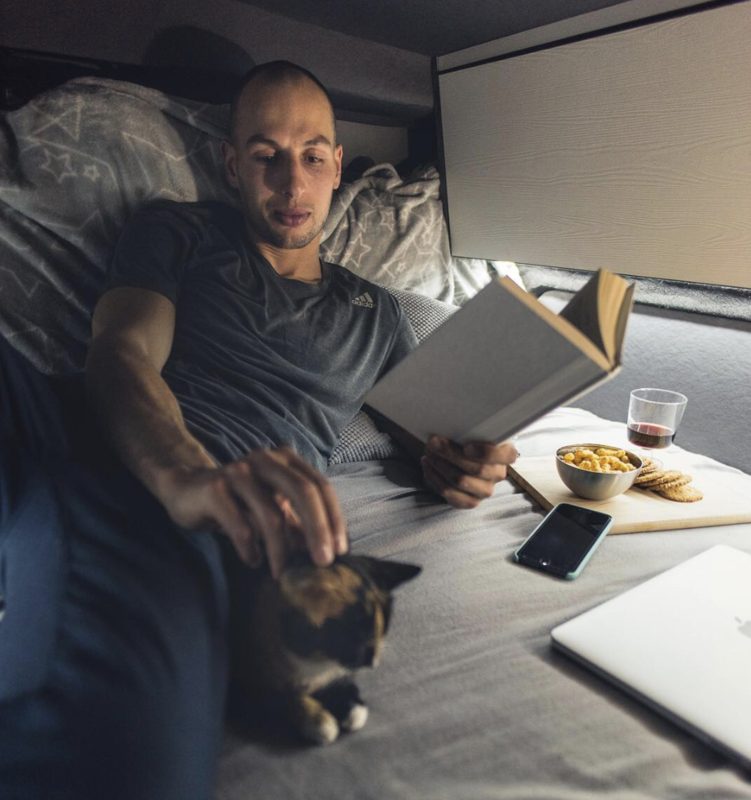 I would even argue that living in a van has given me more time to communicate with those I love; before, my 9-5 job, gym and sleep routine took up most my energy. It feels weird to record yourself for the first time, but it becomes addictive the moment you receive a recording from someone else. Hearing a family members voice while they are so far away has a beautiful calming effect, especially if there’s any lingering homesickness. My friends say they listen to my recordings while cooking, brushing their teeth, or procrastinating at work. In the age of WhatsApp there is no excuse for failing to communicate with the ones who’ve supported you from the beginning, even if you live in a van. Our physical health and mental health have been affected in different ways since packing into our Jumper. Physically, we have become healthier people. We eat clean since we cook ourselves and exercise often in the form of hiking, city strolls, and biking. You burn a lot of calories swimming at the beach, biking along the the castles and walking in circles searching for the nearest bar. Living the full time van life outside of my home country is a major health privilege. Neither myself nor my partner have any health issues we need to consistently see a doctor for. We have purchased international health insurance just in case anything unexpected does happen, though. This has already come in handy at local public hospitals when I’ve broken bones or he’s broken out in a rash from a poorly planned bush pee. Mental health has been the biggest change. Humans respond to nature, and spending more time in the natural world has put a lot of big city problems in perspective. Additionally, living in a small space and adopting a minimalist approach to material goods has lessened our monetary struggles. It’s allowed us to focus on our time and our relationship instead of our clutter. Plus, it becomes really easy to focus on the relationship with your partner when they’re always there. All the time. Living in that tiny space in the middle of nowhere. Trust me. 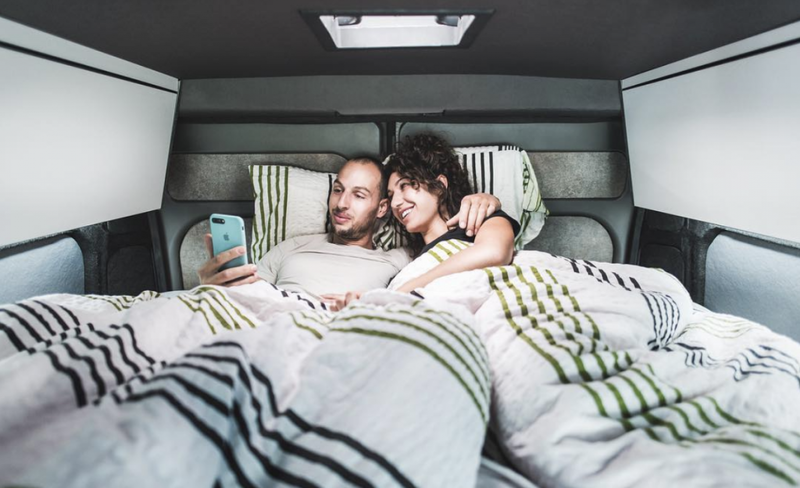 Sleeping in a vehicle is a major deterrent for those considering van living. Everyone has their preferences, and sleep preferences divide the masses. Whether it’s a sleeping mat or in a king size feather mattress, we are all chasing those 8 beautiful hours; uninterrupted and safe. We have a queen size bed in the back of our L2. It’s elevated above our bikes and we have a step that helps us climb onto it. The bed it set high, aiming to utilize as much of the van space as possible. This allows us optimum storage and a very cozy atmosphere on chilly nights. 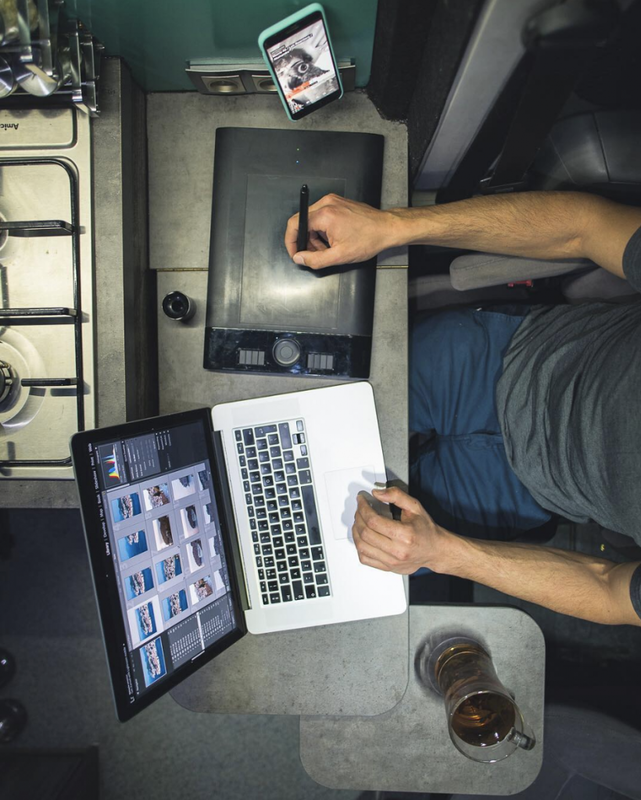 The beauty of designing your own campervan conversions is that you can design it around how you prefer to sleep. If you want the bed to take up the majority of the van, make it so! We prefer more space for our kitchen, seating and storage, so our bed is smaller. We did put a roof window in above our heads so we can fall asleep looking at the stars and have fresh air overnight. This is just some of the perks of full time van life, as many of you know! The safety factor while sleeping in a car is of the utmost importance. It’s not worth sacrificing safety for a nap. I don’t mind gas stations and formal campgrounds; it’s well lit and you can honk for attention to quickly be heard. National parks and beaches are my favourite: peaceful, beautiful, and well recommended on most camping apps. Survival instincts help most to avoid small dirt roads surrounded by abandoned buildings covered in spray paint. Of course, safety depends on which country you’re staying in, so each traveler should research thoroughly! We installed a safe in our van and also make sure to lock the door before going to sleep, just like at home. Unplanned morning wake-up stories always stick out in my mind the most. Our first full time van life night in Croatia we had crossed the border at 11:47pm with 13 minutes remaining on my Schengen Visa. We hadn’t put up our curtains that night and the next morning we awoke to a massive pounding on the door. The police demanded to enter the van and were fairly confused to why a Czech and an American were sleeping on the side of the road in a tiny village. After a short exchange we realised they thought our tripod was a rifle through the window. They smiled, after asking for a quick tour of our “sleeping van” and left us very awake and giggling. Always put up your curtains, people! A huge reason full time van life is so appealing is because it’s cheaper than a mortgage with all the benefits of adventure. Additionally, traveling can quickly turn expensive if you’re paying for a hotel bed and restaurant food each day, along with taxis and other forms of transportation. For many, traveling is often paired with the hassle of protecting or maintaining a home while away from it. Some people can just leave, but for others it turns into paying house-sitters or organising Airbnb guests. 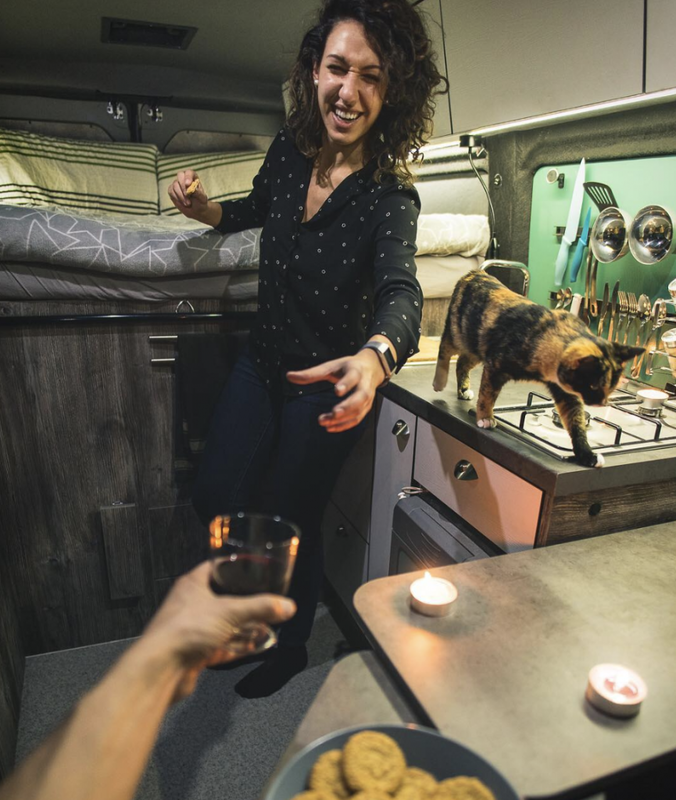 We’ve met many full time van life travelers who’ve sublet their apartments or rent out their homes to help fund their trips. They’ve soon realised how little they require to travel happily and how unnecessary it was to spend so much money on things they don’t even miss while away. You don’t need 365 outfits, 20 photo frames and 7 sets of different coloured dishware. You can love it and own it, but you don’t need it. I shop for less for clothing now. I don’t buy many decorations for the van. I spend less on Starbucks coffees and Walgreens snacks because I always have my grocery purchases near me, in our campervan. When you have less space, you become more particular to how it is filled. When living in an apartment or a home you don’t realize how much junk you own until packing it up and moving it into the next place, a bigger place, costing more money. We are a digital nomad, making our money online. That comes with some obstacles, such as SIM cards, hotspots, and irregular pay checks. We’ve worked in some ridiculous places, but it’s worth it. It’S worth it because I wake up with a new, astonishing view every morning. I love full time van life. Period. What would your monthly bill look like if that’s all you needed to spend money on? For me it’s better to work in a beautiful environment, even if the work is random. Besides, spending US dollars in other countries with weaker currencies goes much farther than it would at home! In closing, full time van life isn’t for everyone, but I don’t believe it’s reserved for the crazies or the cheap. I see vanlifers as very practical travelers who look at travel as something beyond the 2 week vacation time from work. Even if these reasons don’t convince you, hopefully it sheds some light on the current trend, be it for better or for worse. Happy travels, you’ll see me on the road! 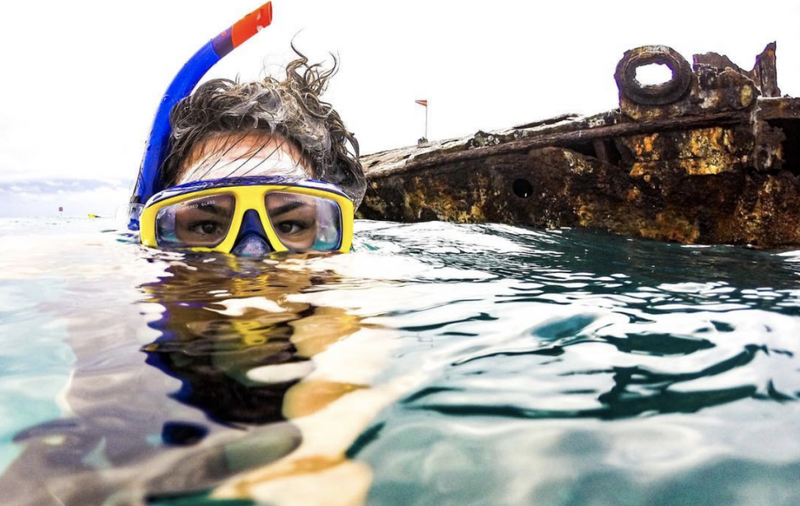 Follow @curlyhaircamping on Instagram to keep up with her adventures!